If you’re looking for fun travel or vacation ideas in Orange County, you’ve come to the right place! 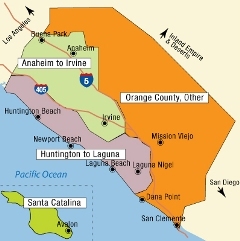 While Orange County is the smallest southern California county in terms of area, it’s the second most populous county in the state. Largely agricultural when it became an entity separate from Los Angeles County in 1889, the completion of a trolley connecting the two in 1904 transformed the area into a weekend retreat for Hollywood celebrities. Since the 1950s — when Disneyland was added to the area’s attractions — Orange County has evolved into a favorite California vacation destination. Whatever you’re looking for – from beautiful beaches to theme parks to championship golf courses – you can find it here. As Disneyland is the state’s most popular tourist attraction, many Orange County vacationers spend at least one day visiting that park and perhaps another day at Disney’s California Adventure. Sports fans may also want to check out a California Angels baseball or a Mighty Ducks hockey game while in Anaheim, but most folks head for the ocean and the beach towns that dot the county’s 42-mile coastline. Orange County’s beach communities each seem to have a unique personality and flavor – friendly Huntington Beach (aka “Surf City”), posh Newport Beach, artsy Laguna Beach, laid-back San Clemente and mission-centric San Juan Capistrano – so you can pick and choose or sample them all! You can even catch a ferry to Santa Catalina Island from Newport Beach, Dana Point or Marina Del Rey. When you tire of the beach scene, head back inland to Knott’s Berry Farm in Buena Park (especially popular with children five and under), the Crystal Cathedral in Garden Grove or the Nixon Library in Yorba Linda. Orange County has been used as a shooting location for several films and television programs, including three that were filmed in or around the City of Orange’s Old Towne Plaza: Tom Hanks’ hit, That Thing You Do, Martin Lawrence’s Big Momma’s House and the Coen Brothers’ The Man Who Wasn’t There. A key scene of another hit, the first The Fast and The Furious, where a green Eclipse was blown up in a parking lot, was shot at a TK Market in Westminster’s Little Saigon, which itself was the subject of a 2004 PBS documentary Saigon, U.S.A Teens and young adults may be familiar with the Fox series The O.C. that ran for four seasons (ending in February 2007) and was set in Newport Beach (although actually filmed in Los Angeles). While locals are largely critical of the way their community was depicted in the series, “The O.C.” has caught on as a nickname for the area.